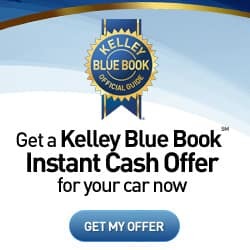 In order to provide you with the most fair and accurate trade-in value, we use a third-party valuation tool, Kelly Blue Book. By entering your zip code and selecting “GO”, you’ll be linked to KBB’s Instant Cash Offer page to provide specific details on your vehicle.In order to provide you with the most fair and accurate trade-in value, we use a third-party valuation tool, Kelly Blue Book. By selecting “Get My Offer” offer, you’ll be linked to KBB’s Instant Cash Offer page to provide specific details on your vehicle. After completion, Kelly Blue Book will provide us and yourself with the “Instant Cash Offer”, valid for 3 days after submission. Alternatively, if you’re short on time and prefer a quick, estimated range, use our Quick Trade-In Estimator Form and provide some basic information on your vehicle. We’ll use Kelly Blue Book’s pricing tool and contact you with an the estimated range. Give us a call at 415-455-5508 or contact us via message. We look forward to hearing from you.